In this paradigm, the aspects that distinguish a particular school from others – or the identity of a school and the mission of the institution – are overlooked. So many marketing and enrollment opportunities are lost when a certain question goes unanswered: what is it that makes this school unique? If prospective student families aren’t truly aware of what makes your school stand apart from other schools, it becomes significantly less likely for them to visit, apply, or enroll. To ensure that your marketing efforts capitalize on prime-time with prospective families, developing and strategically implementing several unique selling points will help improve your overall levels of engagement. To start, it might be helpful to revisit your institution's mission statement. If you can assemble a small group of individuals that span different functions at your school (including admissions and marketing), brainstorm several answers to the question: “What makes [YOUR SCHOOL] stand apart?” After initial brainstorming, narrow your USPs down to 3-5 points that can be used in your marketing efforts moving forward. Try and focus on particular aspects of your school that aren’t shared by other institutions. If you offer a specific program that isn’t offered elsewhere, start there. Once the group has come up with a handful of points, you’re off to a great start. You’ll refer back to these frequently, and your points will help guide you through steps 2 – 4 below. TIP: [RESOURCE] Download Enroll Media Group’s free USP worksheet, and record 3-5 points that distinguish your school from your competitors. If you lose accepted students to a small group of schools from year to year, take a look at their website, branding, and marketing collateral (viewbooks, handouts at admission fairs, digital ads, landing pages, etc.). What do they focus their messaging on? Paring your messaging down can be difficult. Whether it be in print or online advertising, your content needs to succinctly yet adequately introduce your institution. Before proceeding, make note of the messaging featured by your peer institutions. If you find repetition with your school’s final 3-5 USPs, consider swapping in other unique points discussed in the “initial brainstorming” phase at the start of this exercise. 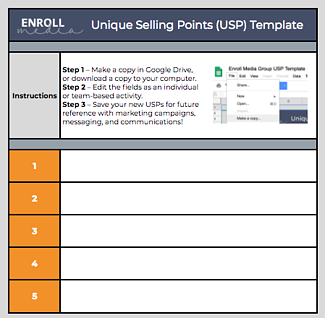 TIP: Revise (if needed) the 3-5 points to distinguish your school from your competitors on EMG’s USP template. Now that you’ve referred back to your school’s core identity and messaging from your competitor schools to develop and refine your USPs, let’s focus on an incredibly important part of the equation: your prospective families. And if you’re a nonprofit, your prospective members. It is common for Admission Officers and Directors of Marketing to understand the ideal types of families/students – or personas – that would thrive as part of their school community. After all, the success of institutions relies on recruiting and retaining students, and understanding these personas represent their best chance at doing that successfully. Take a few moments to discuss or ponder who your marketing “personas” are – and where you might you find them. More specifically: where does your audience spend their time? (to help inform your digital efforts and ad spends). We’ll expand on the latter in our final step below. 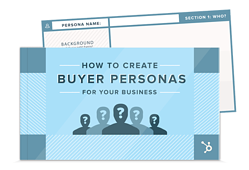 TIP [RESOURCE]: Use HubSpot’s free Persona Template for help developing and documenting the personas for your school! There are an array of marketing platforms and mediums at your disposal, but how do you pick the avenue that’s right for you? Start by pinpointing the funding available to you with your own budget (or shared budgets, as many tools – like HubSpot – can serve institutional functions ranging from marketing to alumni relations and development). Do you have any historical reference for campaigns and advertising efforts that have been fruitful in the past? Any reference points would be helpful to assist in selecting a suite of platforms or solutions to use during the next few months. With a strong sense of your available budget, tactics that have (and haven’t) worked in the past, and your USPs, you’re ready to jump in. Facebook and Instagram can be used as a powerful tool to reach parents by leveraging a list of emails, or or by building new audiences based on parental status and age, geography, affluence, career industries, skills, interests, and more. Paid Search can help reach potential parents who are conducting private school-related searches or childcares relevant to your offerings. Display Advertising is helpful to re-engage with your website visitors via retargeting, and reach new users based on behavioral and demographic criteria. Regardless of your familiarity with creating marketing plans, messaging strategy, or branding, it can be helpful to speak through your enrollment needs with experts in your field. If you'd like to discuss the best ways to tackle your advertising, let's talk. We thrive on hearing from independent schools and organizations, and we can’t wait to help you achieve your individual goals.